Breeders can subscribe to our regular breeders email newsletter. The Australian Canine Eye Scheme (ACES) is a national assessment system for registered dog breeds that offers a reliable screening service for a range of congenital and inherited eye conditions. Eye assessments are carried out by registered veterinary eye specialists. Why do we need a national eye scheme? Where possible, we should try to minimise the chances of passing on painful or vision-threatening eye conditions from one generation to the next. Regular ACES certification helps breeders plan mating programs and reassure other breeders and potential owners about the soundness of their current stock. It also provides a way for breeders of valuable pedigree puppies to have whole litters checked by a qualified eye specialist to confirm normal eye development before sale, in the event of a buyer dispute occurring later. ACES exams screen for a range of eye diseases including those involving the eyelids, tear ducts and surrounding structures. Only conditions affecting the eyeball (cornea, iris, ciliary body, lens, vitreous, retina and optic nerve) are recorded. Examination procedures are prescribed by the Australian College of Veterinary Scientists Ophthalmology Chapter and meet international standards. For a given eye condition, affected breeds will be listed as either Schedule 1 or Schedule 2. Schedule 1 includes those breeds in which there is a known tendency for inherited defects. Where defects are found, results will be sent to the ANKC to be recorded on a canine inherited diseases database. Schedule 2 lists breeds in which a few affected cases may have been seen, but the true prevalence remains uncertain. The benefit of the Schedule 2 list is that it alerts breeders to potential problems as they arise. How do I arrange to have my dog tested? The AVA appoints a panel of qualified eye specialists to issue ACES certificates and maintain up-to-date contact information. Eye testing appointments may be made with the ACES panellist of your choice, either directly or through your veterinary practice. In breeds susceptible to early onset eye disease, it is best to test all pups in the litter between 6–10 weeks of age. For most known eye conditions, the best age for the initial adult eye test is generally considered to be before they turn one. A cataract is an opacity of the lens. There are many causes for cataracts, old age is the most common cause in humans. In additional to ageing, canine cataracts can be caused by diabetes mellitus, PRA-progressive retinal atrophy and also cataracts can be inherited. However in some dogs we do not find a cause, the cataracts develop spontaneously. Unfortunately many breeds of dogs can be affected by inherited cataracts. At Animal Eye Care we see many breeds affected by inherited cataracts. These include Belgian Shepherds, Cavalier King Charles Spaniel, German Shepherds, Irish & Red Setters, Leonberger, Old English Sheep Dog, Labrador Retriever, Siberian Husky, Poodles, Cocker Spaniels, Golden Retrievers, Boston Terriers, Australian Cattle Dogs, Miniature Schnauzers, Maltese, and Staffordshire Bull Terriers. If we see a young dog with a cataract we may suspect that it is inherited. Generally inherited cataracts affect both eyes, in specific areas of the lens, at specific ages. Check the ACES – Australian Canine Eye Scheme website - http://www.ava.com.au/about-us/programs for the reports breed by breed on inherited cataracts. You will quickly notice that the most common finding of abnormality in 2010 was HC – hereditary cataract. Breeding dogs should be examined annually whilst being bred from to check their eyes for cataracts. Dogs affected by cataracts and their progeny should not be bred from. In some cases it can be difficult to know if the cataract is inherited or has developed from other causes. Your Veterinary Eye Specialist will be able to advise whether a cataract is likely to be inherited. In some dogs the cataracts may progress and affect vision. In cases, when the cataract is still developing and there is no reaction (Lens Induced Uveitis) surgery is successful in over 90% of cases in restoring useful vision. It is important to stress that cataract surgery is best done whilst the cataract is developing. In the past it was often recommended to wait for the cataract to fully develop. This is no longer the case. The earlier the cataracts are removed the better is the outcome. Many dogs older than 10 years of age will have cloudy lenses. This is often not a cataract, but is in fact normal lens ageing. This is not inherited, and should be of no concern to a breeder. The normal lens ageing may cause poorer close up vision so that a dog may have trouble with bits of food up close, or trouble with steps. Some dogs have poorer night vision, but will not cause blindness. Surgery is not needed for normal lens ageing. PRA is an inherited disease that causes blindness in dogs. Breeds seen most commonly at Animal Eye Care with PRA are Labradors, Poodles, Cocker Spaniels and Australian Cattle Dogs. Most other breeds have been reported to have PRA. Crosses can also be affected with PRA. Cats are also prone to PRA, and is seen most commonly seen in Siamese and Abyssinians. There are 2 main types of PRA. Young age onset. This is seen most commonly in the Collie and Irish Setter. Affected dogs show night blindness by 18 months of age and are blind by 36 months of age. The most common form of PRA is the late onset form. These dogs classically show night blindness around 5 years of age and are then blind by 8 years of age. At Animal Eye Care the late onset form of PRA is by far the most commonly seen form. Dogs affected with Progressive Retinal Atrophy may initially show signs of night blindness. These dogs may be reluctant to go out at night, will only go out at night when the light is turned on, walk into things at night, or are noticed to have increased green or yellow reflection coming out of the eyes at night. Night vision is first affected because the rod cells in the retina are first affected by PRA. Most dogs will have poor night vision for 6 to 36 months before they start to lose their day vision. Most dogs cope quite well with poor night that these early signs of PRA are commonly overlooked. With time the cones, the retina cells used for day vision begin to be affected. These dogs will walk into things at all times of the day and night. Remember that some dogs cope extremely well with slow vision loss. These dogs adapt and learn their environments, they are only noted to be blind when the environment has changed eg in a boarding kennel, or away at the beach house. In some cases the vision loss is overlooked as the dogs cope so well, problems are only noted when the affected dog develops cataracts. These dogs have cloudiness in the pupil. Normal canine retina. Note the numerous blood vessels. A severe PRA case. 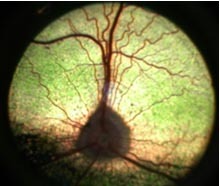 Note the loss of blood vessels and the smaller and darker, circular optic disc at the bottom of the green. 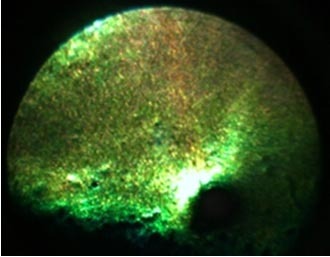 Note the increased shiny reflection from the green layer. PRA is an inherited trait. It is autosomal recessive in most breeds. This means that dogs can carry the gene but not be affected, but can pass on this trait to their progeny. DNA testing can be done on blood or saliva at any age to detect whether a dog will be affected, a carrier or genetically clear of PRA. There is no treatment for PRA. Some have suggested using anti-oxidants but there are no studies to show that this is of benefit. Prevention is the only way to deal with PRA. Affected dogs, their parents and their progeny should not be bred from. Annual eye testing with the ACES – Australian Canine Eye Scheme should be done in breeds prone to PRA. Nearly all dogs with PRA will end up developing cataracts. There is little benefit in removing these cataracts as any improvement in vision is only temporary. It is important that when cataracts developed that the eye is closely watch for redness on the top if the eyeball. Any redness on the top of the eyeball might suggest reaction by the body against the cataract. In these cases it is important to seek veterinary advice. This reaction needs to be treated otherwise severe pain can develop inside these blind eyes. This Labrador has cataracts secondary to PRA. It is very important to check the whites of the eye for redness. Any redness on the white of the eyeball suggests reaction by the body against the cataract and this can cause pain inside the eye. The normal pressure within the eye is 10 to 25 mm Hg. When the pressure is increased (usually > 30 mm Hg) a diagnosis of glaucoma is made. The increased pressure can rapidly cause blindness, and also pain. Once the eye is enlarged the eye is blind. We measure the pressure in the eye (intraocular pressure - IOP) with a tonometer. In many dogs the outflow of fluid from the eye is blocked by an abnormal drainage angle. This is known as PRIMARY GLAUCOMA. Breeds that are most commonly affected by this include Basset Hounds, Cocker Spaniels, Australian Cattle Dogs, Fox Terriers, Poodles, Maltese and Golden Retrievers. Glaucoma can also be SECONDARY to inflammation (uveitis), lens luxation, blood in the eye, and to growths in the eye. c) Dilated pupil that will not become smaller when a bright light e.g. penlight, is shone into the eye. The usual presentation is a dog with a blind, painful eye. This needs to be relieved, and treatment given to the good eye to delay glaucoma developing in the good eye if it is predisposed to glaucoma. This condition may get worse, even with the correct treatment. Drops and tablets seem to work extremely well in humans, but are rarely effective in dogs. Surgery is usually required to control glaucoma, in some cases we will use a very new medication called Xalatan. One drop once daily is required. With time we find that some glaucoma cases are not as well controlled on the Xalatan, and surgery may then be required. The management of glaucoma depends on whether or not the eye is still visual or has a chance to regain vision. Potentially we can save vision in the eyes if the glaucoma is treated within the first 48 to 72 hours, and also when the eyeball has not been enlarged. To save vision: we use a state of the art Diode Laser to destroy some of the fluid producing cells inside the eye. This is what is commonly done in humans that no longer respond to medications. We generally keep the patient in for 3 to 5 days and intensively treat the glaucoma. For blind eyes: it is important to treat the glaucoma to try and reduce the pain inside the eye. It is hard to assess pain in animals, but we find that nearly all our patients are brighter, more active after having glaucoma relieved. Humans described the pain like having a bad headache; you can function, but not happily. For blind, enlarged eyes we recommend an Intrascleral Prosthesis. For blind eyes that are not enlarged we can laser to control the glaucoma. Prevention We can check to see if an eye is predisposed to glaucoma by examining the drainage angle with a special contact lens. This is called Gonioscopy. If the drainage angle is malformed then there is a greater risk of glaucoma developing in the eye. q If you are suspicious of glaucoma please call Animal Eye Care for advice. During office hours please call 9563-6488, after hours call 9572-1966.